Strathwood has broadened its handsome collection of cast-aluminum furniture with the St. Thomas ensemble. 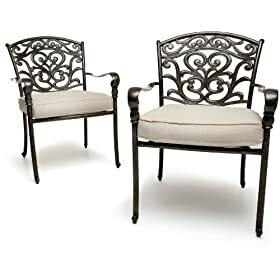 Durable yet surprisingly lightweight, these two armchairs add a more upscale look to a deck or patio than wooden furniture, and are easier to move around. Screw-on glides underneath the chairs' legs allow some leeway in adjusting for uneven surfaces. Able to hold up to 500 pounds, each chair measures 25 inches wide by 27 inches deep by 36 inches high and weighs 16-1/2 pounds. Adding comfort to each metal chair is a 3-inch-thick cushion upholstered in fabric designed for outdoor use. The light beige cover is made of Olefin, which repels water and wipes clean but does not remove for cleaning. Two Velcro tabs on the back attach the cushion to the chair so it won't slide around or blow off in a strong wind. The tabs are located in the centers of the back corners, allowing for easy flipping of the cushions to hide spills or just to rejuvenate them. Each cushion measures 21-1/2 inches deep by 20 inches wide. The full St. Thomas dining collection includes a dining table, a side table with ice bucket, a choice of dining armchair styles and an umbrella with matching base. For further accessorizing, pair the pieces in this collection with pieces in the St. Thomas Cast Aluminum Deep Seating Collection. Each piece features the same ornamental scrolling vine motif in a dark-brown finish with bronze highlights and silver flecks. This all-weather, easy-care furniture is made from the highest grade of aluminum. It is sand casted, covered in a powder-coat finish, and designed to be rust-free. Please note that upholstered items purchased on different occasions over time may have a slight variation in hue. There is the potential for variation in the hue of any fabric, depending upon the light source in which it is viewed. For outdoor fabrics, sunlight is the source textile manufacturers use to verify hue accuracy. In addition, a slight variation in hue is normally expected between rolls of like fabric, since no two can be produced to come out exactly the same.